LA Galaxy were on a different planet to New York City as they scored five goals under the Californian sun to put them top of the Western Conference. Frank Lampard was injured meaning he could not face his ex-England teammate Steven Gerrard however the line-ups were as star-studded as possibly any game in the history of MLS. 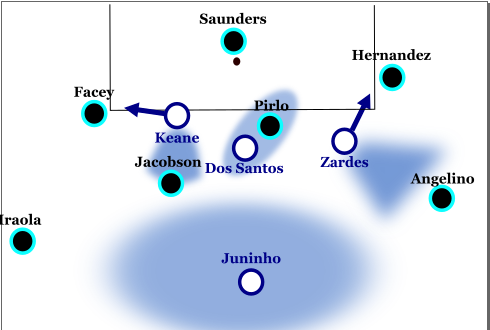 Bruce Arena opted for a 4-4-1-1 formation for his Galaxy side while New York City played in a 4-2-3-1 with an asymmetric double pivot of Andrew Jacobson and Andrea Pirlo. Playing in eighty degrees Fahrenheit (30 Celsius) is no easy task however New York City’s urgency when they had the ball was dreadful. They took very long on the ball and rarely looked to penetrate the final third. In fact, only 26% of their passes targeted the final third zone, while 34% of Galaxy’s passes targeted the final third. City simply passed from side to side in a U-shape while Galaxy’s well-organised defence shifted well and blocked passing lanes into the forwards successfully. New York City’s main outlet was obviously Andrea Pirlo, who played some very neat line-breaking passes and shook off pressure well however he isn’t Messi, and can’t do it all himself. The movement off-the-ball for him was at time non-existent, especially runs behind the opposition’s defensive line, an area which Pirlo is brilliant at finding with high passes. City’s intensity increased slightly after the half-time break, with Pirlo rarely taking more than two touches before finding a pass, however they still struggled to find any penetration and didn’t even look dangerous on the counter-attack, with Poku being their only player with any real pace. In my opinion, Pirlo should have been situated slightly higher up the pitch instead of being tasked with at times performing La Salida Lavolpiana as he dropped between his centre-backs, or generally playing in deeper areas to keep possession ticking. His creativity would have been more beneficial if he was allowed a free-er role where he could move forward, or even playing as an old-school enganche. City created a couple of chances in the first half, and used a right-side overload. Below, we have one example of when this overload was used, here ending up with a good chance for Mcnamara which he put over the crossbar. New York’s wide right overload. Iraola pins Rogers away from the rest of the defensive line and Leonardo has three players to deal with. Pirlo is deep into LA’s half, where he can best use his creative passing. Mcnamara was NYC’s most dangerous player, especially in the first half. He would take up very wide positions where he would be completely unmarked and would be targeted with long diagonal balls. Part of the reason for NYC’s lack of penetration and just three shots on target all match was Galaxy’s defensive organisation. 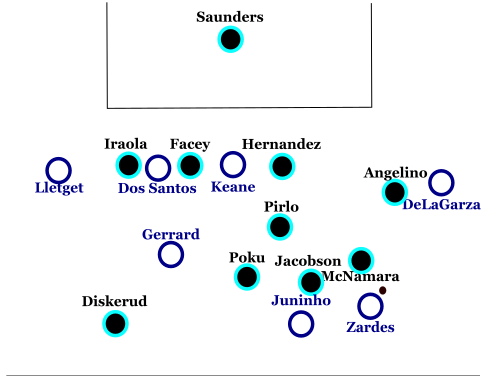 They sat back in a 4-4-1-1 shape as shown below with very good control of the centre of the field, Giovanni Dos Santos man-marking Andrea Pirlo, and Robbie Keane closing down passes between the back four, forcing NYC to use Saunders to switch play on many occasions. They also defended very effectively one-on-one when isolated. 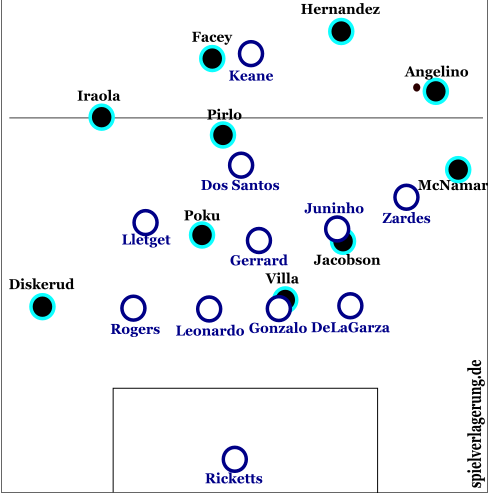 LA Galaxy’s compact shape with focus on man-marking Pirlo and controlling potential passing lanes in central areas. While Galaxy didn’t press with too much intensity in scenes such as the one above, and didn’t really need to as NYC’s passing was harmless, they always stopped NYC playing short from goal-kicks, something which their analysts obviously made note of NYC doing regularly. They move completely out of what would naturally evolve from a 4-4-1-1 base shape and pressed with Dos Santos, Keane and Zardes very high up the pitch to stop the short ball. Juninho was placed around 20 metres behind these three, covering a huge amount of space. Galaxy prevent NYC from playing short via Saunders. NYC were pretty stale in possession but at the end of the day they conceded five goals. A mixture of dreadful compactness, slow defensive transitions and Galaxy’s individual quality were the reason for this. New York were positionally orientated with a small degree of man-orientation, especially when sticking tight to LA forwards dropping to receive the ball. This action of sticking tight to dropping players is sometimes effective when performed by midfielders but when centre-backs do it, it just leaves big spaces in behind them and that’s what happened to NYC. In addition to this, New York dominated the left side the pitch with Robbie Rogers and Sebastian Lleget forming a formidable partnership. They had bags of qualitative superiority over NYC’s right side and successfully penetrated the penalty area through the left side many times. 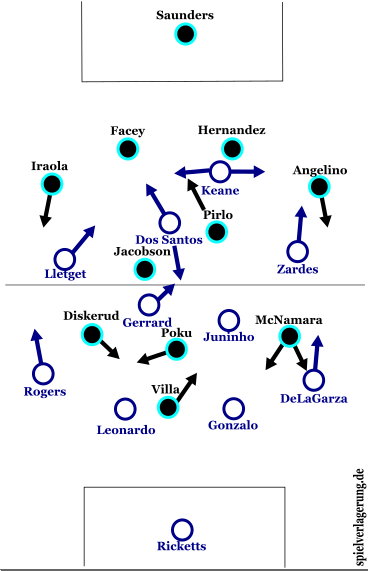 The main problem, however, was NYC’s complete lack of both horizontal and vertical defensive compactness which allowed The Galaxy to play numerous through balls. This was best exploited in the second half when NYC decided to play a catastrophic medium-high defensive line. It was catastrophic as they didn’t play an offside trap, their centre-backs have no pace, and Saunders didn’t act as a sweeper-keeper. Below is an example of their poor horizontal compactness (and pretty poor vertical compactness too). The distance from fullback to fullback is around 3/4 of the pitch, there are large gaps between most of the back four and Gerrard has found a huge pocket of space. And finally, poor vertical compactness from NYC. The huge gap between their defensive and midfield lines leaves them very vulnerable when LA manage to find a pass in between said lines. If they want to press higher up the field, their defensive line has to push up with them. LA Galaxy played with immense quality and should be favourites to win the Western Conference. The chemistry between Giovani Dos Santos and Robbie Keane is something to really look forward to over the coming months. Some teething problems for NYC in their first ever season. They still have Frank Lampard to join the first XI which will add some final third threat but won’t do much to aid their problems of off-the-ball movement and pace.